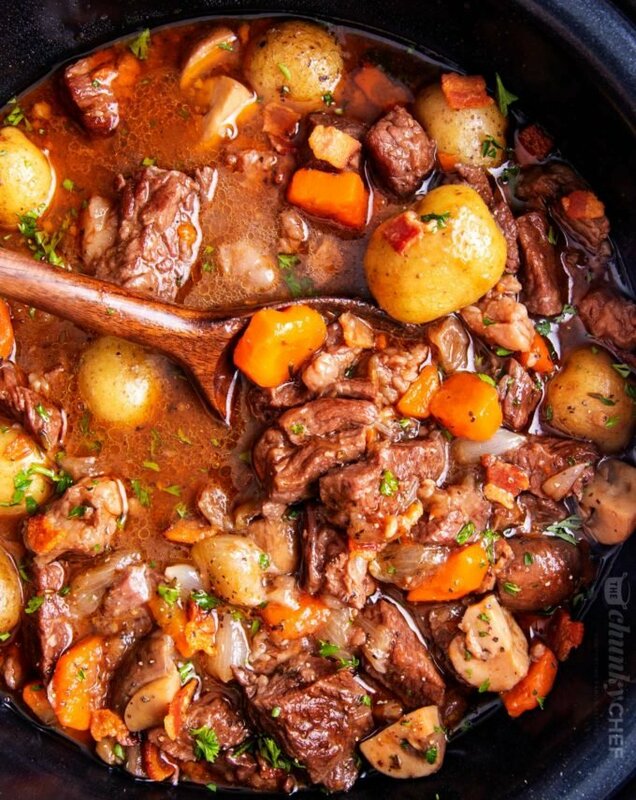 Rich and hearty, this crockpot beef bourguignon is the ultimate winter comfort food recipe! You’ll love the amazing flavors! 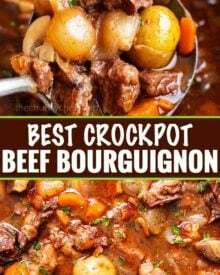 Beef bourguignon doesn’t have to take hours in your oven, you can make it low and slow right in your crockpot and come home to an amazing meal! This time of year, I’m torn. 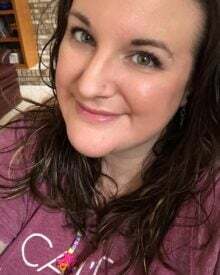 Part of me yearns for warmer temperatures and Spring rain, and the other part of me doesn’t want to give up the cold, bundling up, and of course, stick-to-your-ribs comfort food. 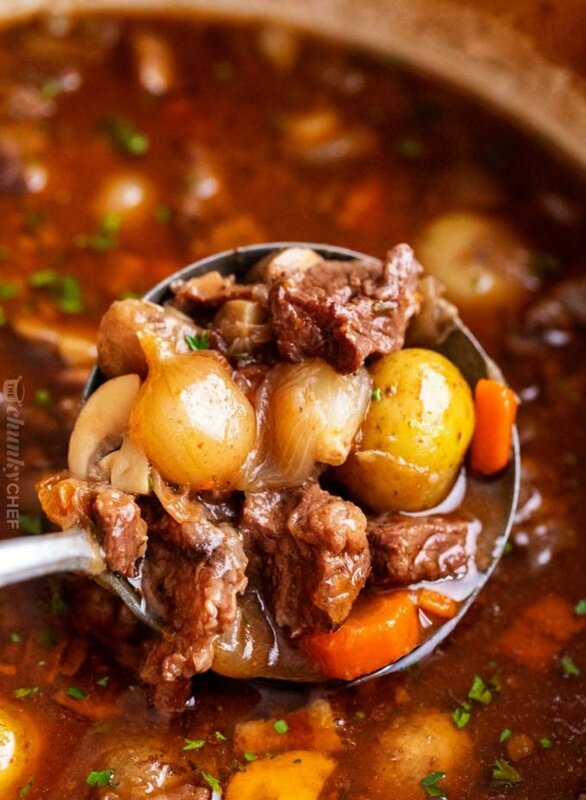 I can’t get enough of casseroles, soups, and stews, like this Crockpot Beef Bourguignon! 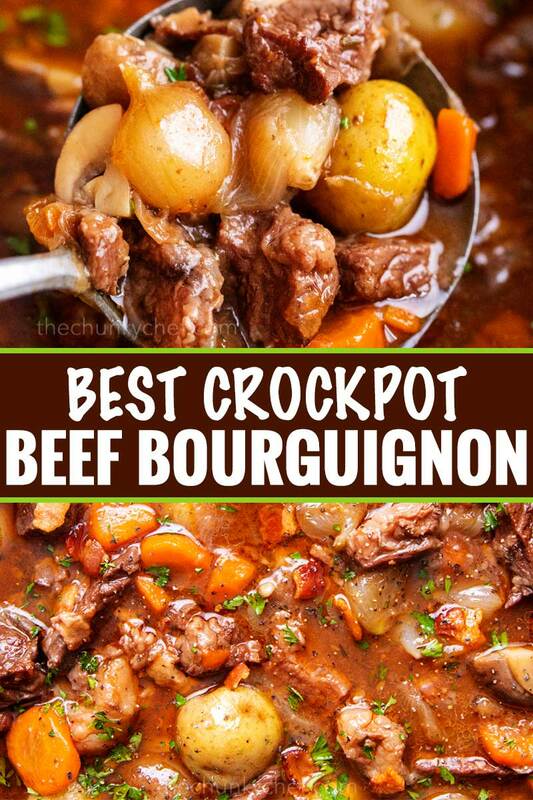 I always thought beef bourguignon was so hard and complicated to make, but once I tried it a few years back, I realized it’s actually pretty simple! And the flavor. Ohhhh, the flavor. 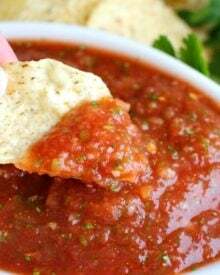 So rich and deep, just BEGGING for some crusty bread to be dipped in it. 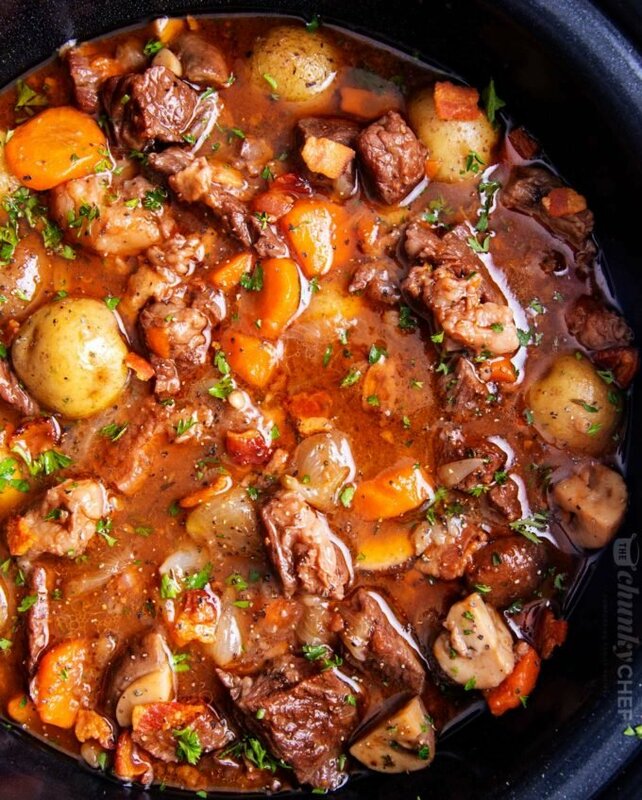 WHAT’S THE DIFFERENCE BETWEEN BEEF BOURGUIGNON AND BEEF STEW? WHAT’S THE BEST WINE TO USE FOR BEEF BOURGUIGNON? 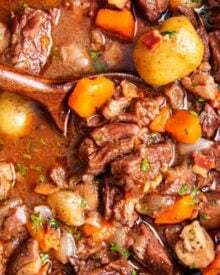 Julia Child, aka the best chef ever, recommends a hearty burgundy wine, and we almost always use a Pinot Noir when we make this beef bourguignon recipe. Just make sure you use a wine that has great flavor and that you like to drink, as the flavor will be concentrated in the stew. WHAT’S THE BEST BEEF TO USE FOR BEEF BOURGUIGNON? Since this recipe simmers for hours, you want a cut of meat that’s rich in connective tissue and marbled fat. 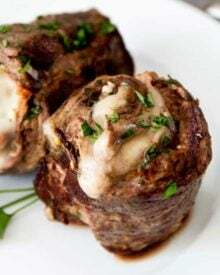 When cooked for long periods of time, those tissues and fat transform even the toughest beef into the most melt-in-your-mouth tender morsels. My personal favorite, in terms of flavor, texture and cost effectiveness is a boneless chuck roast. I buy them when they’re on sale and keep them in the freezer. If your budget is more open, beef brisket is another good option. CAN BEEF BOURGUIGNON BE FROZEN? Sure can! Just make sure to cool it completely, then store it in an airtight container. 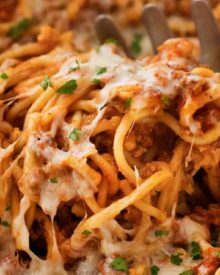 Place the container in the refrigerator overnight to thaw, then reheat until hot and bubbly. HOW LONG DOES BEEF BOURGUIGNON LAST IN THE REFRIGERATOR? Up to 3-4 days, if you can make the leftovers last that long! Rich beef stews like this taste even better the next day, so our leftovers are usually gone within a day or two. 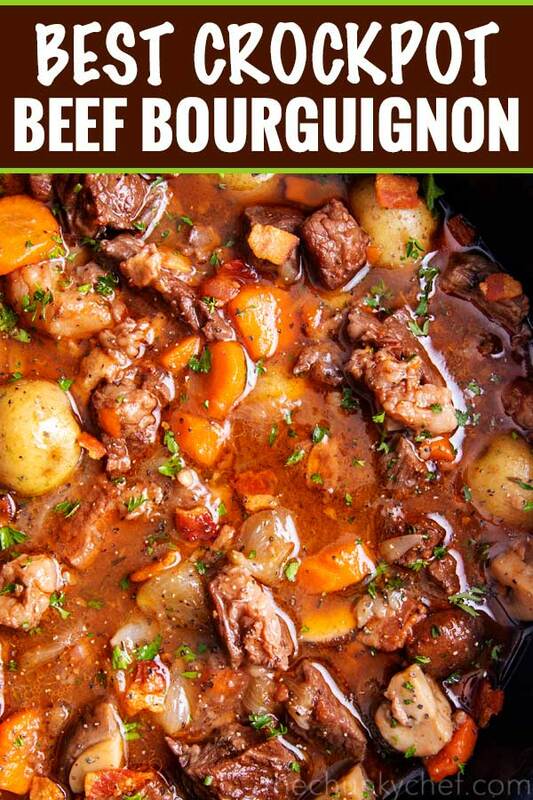 HOW CAN YOU THICKEN BEEF BOURGUIGNON? This recipe calls for a flour dredging before you brown the beef, which helps thicken the gravy a little. If you prefer a thicker gravy, there are two main options. You could strain the liquid into a pot and cook it down until it’s thickened, or you can add a beurre maine. A beurre maine is a French cooking technique of mixing equal parts butter and flour until it forms a paste. The purpose is that the flour is coated in the butter fat, which allows it to mix right into the hot liquid, instead of clumping, like it would if you added flour by itself. This is the method I use most often, as it’s the easiest. 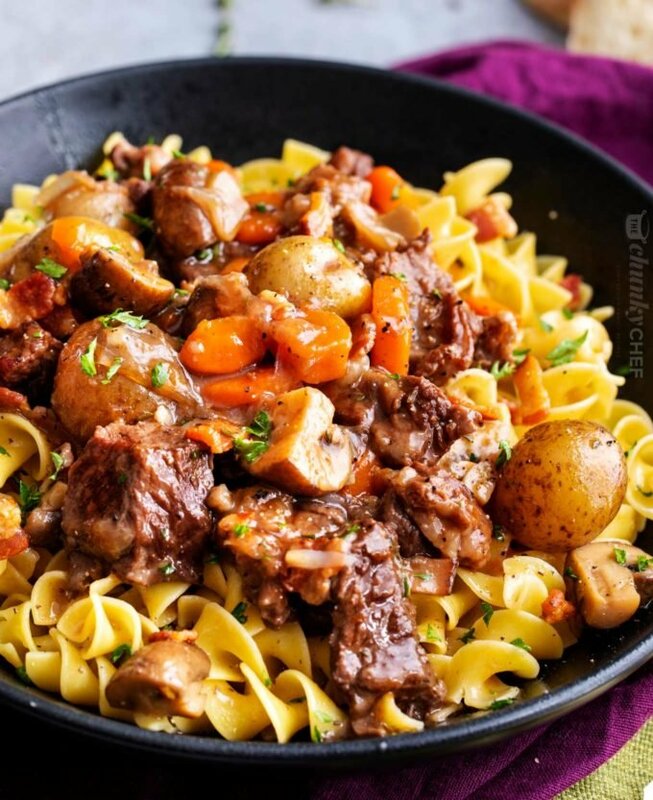 WHAT TO SERVE WITH BEEF BOURGUIGNON? 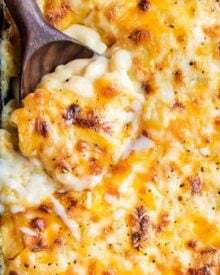 I love to serve this recipe over egg noodles or some creamy mashed potatoes, but it can definitely be eaten by itself if you prefer. A loaf of crusty bread and vegetable (like green beans or peas) are great options as well! Make sure not to cut your vegetables too small. Since they’ll be cooking all day, you don’t want them to fall apart. Be prepared for the house to smell AMAZING!! Slow Cooker – I’ve had this model for years and love it! Instant Pot Duo – if you don’t have one, this is the model I have that I love! Dutch Oven – perfect for this recipe, soups, breads, frying and more! 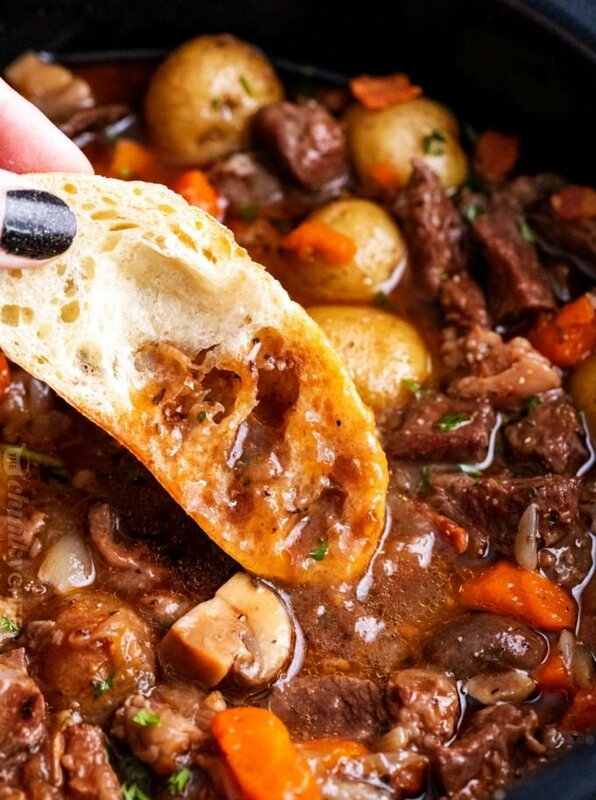 Rich and hearty, this crockpot beef bourguignon is the ultimate winter comfort food recipe! In a large skillet, cook bacon over MED heat until browned and crispy. Remove to a paper towel lined plate. Add beef pieces to a large plastic bag and add flour. Seal bag and shake/massage beef and flour to coat all the pieces. Increase heat to MED HIGH and brown beef in bacon fat, cooking about 1-2 minutes per side, until browned. Remove to bottom of slow cooker. Top with most of the bacon pieces. Pour the red wine in the skillet and use a wooden spoon to scrape up any browned bits from the bottom of the skillet. Those are full of flavor, so don't skip this step! Add all other ingredients (onions through black pepper) and stir to combine. Cover and cook on LOW for 7-8 hours. The last 30 minutes before serving, mix 2 Tbsp butter and 2 Tbsp flour, then add to crockpot. Stir, cover and continue cooking 30 minutes or up to an hour, until gravy has thickened to your liking. Remove bay leaf and thyme stems and serve hot. In a large dutch oven, cook bacon over MED heat until browned and crispy. Remove to a paper towel lined plate. Add beef pieces to a large plastic bag and add flour. Seal bag and shake/massage beef and flour to coat all the pieces. Increase heat to MED HIGH and brown beef in bacon fat, cooking about 1-2 minutes per side, until browned. Top with most of the bacon pieces. Pour the red wine in the pot and use a wooden spoon to scrape up any browned bits from the bottom of the skillet. 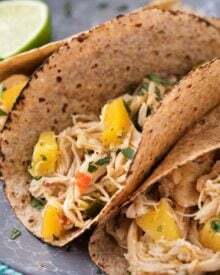 Those are full of flavor, so don't skip this step! Bring to a boil, then cover and transfer to preheated oven. Cook for 2 - 2 1/2 hours, or until the beef is tender enough to fall apart. Add butter and flour, stir, and continue cooking another 30 minutes or so. Bring to a boil, then reduce heat to LOW, so liquid is simmering, and simmer about 1 1/2 - 2 hours, stirring occasionally, until beef is tender enough to fall apart. Set Instant Pot to saute function . Cook the bacon in 1 Tbsp of oil until crisp and browned. Remove with a slotted spoon and set aside on a paper towel lined plate. Sear beef on all sides in bacon fat. Sprinkle with flour, stir well and cook on saute for a further 1-3 minutes. Add cooked bacon and all other ingredients. Stir well, cover and lock the lid into place. Press Keep Warm/Cancel to stop the Sauté setting, then set to MANUAL mode. Choose HIGH PRESSURE and selection 30 minutes cook time. After cooking, allow the pressure to release naturally for 8-10 minutes. Turn the valve from sealing to venting to let any remaining pressure release. Change the Instant Pot or cooker setting back to the saute setting, add flour/butter mixture, stir well and allow the sauce to thicken, uncovered, for another 5-10 minutes. Looks so hearty and delicious! Perfect dinner on a cold night! One of my favorites! So comforting! This looks amazing! I want to warm up to a bowl today! That looks so fabulously flavorful and delicious! 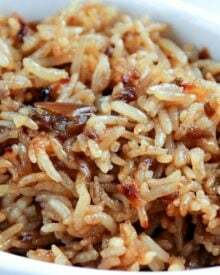 A big bowl of this with some crusty bread is absolute perfection! This is one of my favorite meals! Especially love it with a piece of crusty bread to dip into it. YUM!